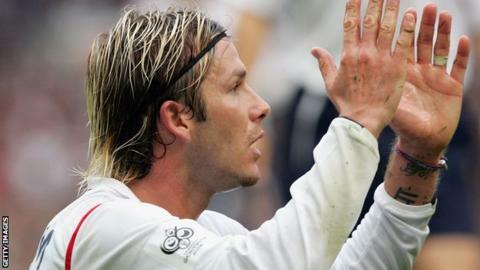 Former England winger Chris Waddle says David Beckham is not one of the top 1,000 players of the last 40 years. The ex-Manchester United midfielder is retiring at the end of the season. "I would say he has been a good player, I wouldn't put him down as a great," Waddle, 52, told BBC Radio 5 live. "You can go down a list of players from the Premier League or the 70s or 80s, whatever you want to do. I'll be honest, Beckham probably wouldn't be in the first 1,000." Beckham, 38, who signed a five-month deal at Paris St-Germain in January, joined Manchester United as a trainee in 1991, making his first-team debut the following year and signing his first professional contract in 1993. He went on to make 394 appearances for United, winning six Premier League titles and the Champions League, and 115 for England. "I think there have been a lot more talented players in the world. But he made the most of what he has got," said Waddle, who made more 100 appearances for four of his clubs - Newcastle, Tottenham, Marseille and Sheffield Wednesday - while winning 62 England caps. "He has got a terrific image and used it very well. He never had a trick, wasn't particularly quick, but he was very good at set-pieces and deliveries, he made chances and made goals and was fantastic for clubs. "He said the right things, he sold shirts, he put money in the tills wherever he went and conducted himself well." Beckham became one of the world's most high-profile sportsmen during his time at Old Trafford - and a global celebrity following his marriage to Spice Girl Victoria Adams in 1999. He signed for Real Madrid in 2003 and won a La Liga title in 2007 before switching to the United States with Los Angeles Galaxy. He also spent time on loan at AC Milan. "As a player I would say he was a fantastic crosser of the ball, a great athlete," said Waddle. "Now people will be talking about him and saying 'How great, how great'. I would say 'how good'. "I would not say he was a great. He was very good at his job, he worked very hard as a professional footballer." Manchester United manager-in-waiting David Moyes, preparing to lead Everton for the final time, has added to the tributes paid to Beckham since his announcement on Thursday. "He's been a great player, a tremendous ambassador. I think everyone who is English is tremendously proud of what David Beckham has done over the years and how he has conducted himself," said the Scot. "I was very fortunate to play with David when he came to Preston North End, he was a great lad then, very humble and really just wanted to play. "Everybody who was part of that team [at Preston] still remembers him and still wants to talk about how they played in a team with David Beckham. I'm no different." Carlo Ancelotti, Beckham's current manager at PSG, said: "The football world lost a fantastic player, lost a fantastic professional, lost a good man. It's the right decision because he decided to stop and not other people [telling him to stop]. "We have to respect his decision. "It's not my business to find a role for David. He's going to speak with the club and if they decide to give him a new position, it is up to David and the club." Beckham trained with Arsenal in January, and when asked if he was interested in signing Beckham, Gunners boss Arsene Wenger said: "Yes, I was. It was at a period when I couldn't afford him. And after that there was a question mark before he went to Milan, but it was a position we didn't really need. "It was always a pleasure to have him here because of his attitude and behaviour. He gained respect from everybody. "No matter how strong a player he is, what remains in your memory is his genuine commitment and dedication and the natural humility which he always had. That will stay forever." QPR manager Harry Redknapp was in charge at Tottenham when Beckham trained with Spurs in 2011. He said: "He was down to earth, everybody loved him, he treated everybody with great respect and he had time for everyone. He's had a fantastic career and is an absolute top-class fella. "He's been a great role model for any young footballer."